The Department is proud to present its annual Kick-off event on October 6 at 5 pm at Theater Dance West 1701. 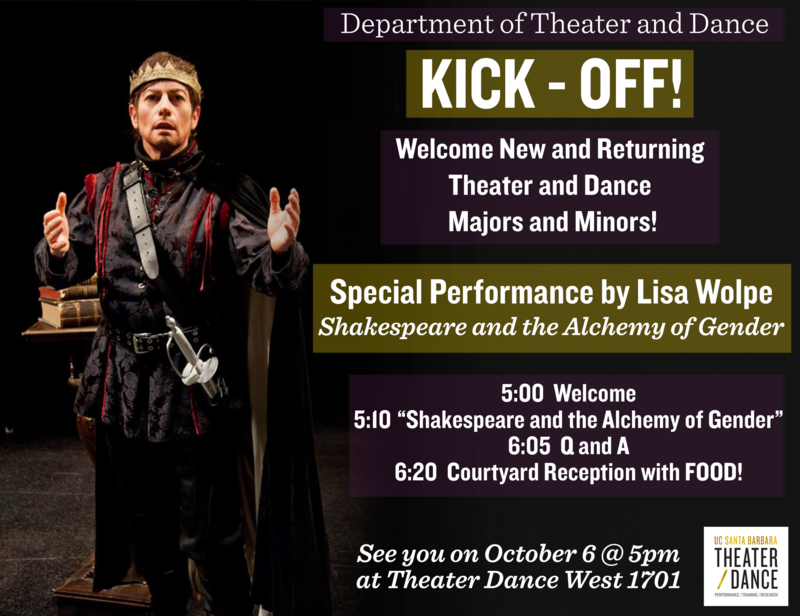 As a part of the Kick-off, the Department will present a special performance by Lisa Wolpe, Shakespeare and the Alchemy of Gender. Lisa Wolpe - actress, director, teacher, and producer - is the Artistic Director of the Los Angeles Women's Shakespeare Company, an award-winning all-female, multi-cultural theater company that she founded in 1993. Ms. Wolpe produced, directed and played Iago in Othello at the Theatre @ Boston Court, as well as creating Jaquis in an all-female cowboy As You Like It and Shylock in LAWSC's production of The Merchant of Venice, for which the company was nominated for four Ovation Awards, including "Best Actress" for Ms. Wolpe. She has produced 14 major Shakespeare plays for LAWSC, directing 12 and starring in them all. Los Angeles Magazine has called the LAWSC "one of the 10 coolest things to do in Los Angeles," and the company has been featured on PBS, CNN, ABC, NBC, CBS and London's International News. Ms. Wolpe has directed 20 productions of Shakespeare's plays and performed leading roles in 17 Shakespearean productions. She has probably played more of the Bard's male leading roles than any woman in history and is featured in the book Women Direct Shakespeare in America. Please read more about Lisa Wolpe in this American Theatre Magazine article.